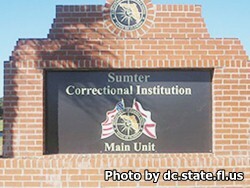 Sumter County Correctional Facility is located in Bushnell Florida. It is a level V facility that houses approximately 1,640 adult and youthful inmates. Youthful inmates at this institution are considered age 14-18. Educational courses offered at this institution include adult basic education, GED courses, OSHA certification, parenting classes, personal finance/debt courses, and vocational aptitude tests. Vocational opportunities at Sumter Correctional Institution include auto repair, consumer electronics repair, masonry, and landscaping. Inmates who are near the end of their sentences can enter the re-entry program which helps prepare inmates for life upon release. The chaplain's office offers a wide array of religion oriented activities including worship. To be eligible to visit an inmate you must fill out a visitors application and wait for it to be approved. Once approved you can visit an inmate on Saturdays and Sundays from 9am-3pm. Registration for visiting starts at 8:15am and ends at 2pm. If you are not registered at 2pm you will not be allowed to visit your inmate.